March 28, 2019 Robert W.
Las Vegas roll up banner stand signs are one of the most used display graphics at trade shows and conventions in Las Vegas. If you walk through a major show at the Las Vegas Convention Center, you will see hundreds of Las Vegas roll up banner stand signs being used. These roll up stands are self standing and can be placed anywhere, which makes them a very convenient graphic. The most common size has about 17 square feet of printable space which allows for a lot of information. The prints roll up into their retractable case afterwards and can be used again at different events. Each roll up banner stand comes with its own carrying case making transportation easy. Millions of people come from all over the world to Las Vegas Nevada for conventions and tradeshows. Las Vegas is a major destination for events and thousands of vendors and businesses display their goods and services at these shows. Many signs and banners are needed for the shows and Las Vegas has a very competitive sign industry that offers great pricing and deals on display graphics. These sign stores have state of the art facilities and equipment to make these signs quickly and efficiently. Many times the signs and graphic displays can be made the same day. Las Vegas roll up banner stand signs come in many sizes ranging from a couple of feet wide to around five feet wide and about six to eight feet tall. Costs for these banner stands with print start at less than one hundred dollars for the economy models and go up to around the one hundred eighty five dollar range for the larger stands and deluxe stands. Check with your local sign store in Vegas and speak with them about these stands if you should need one. March 23, 2019 Robert W.
Cheapest retractable banner stand sign printing in Vegas can get you those upright banner stands at a great price. Banner stands are one of the most popular display graphics at trade shows and conventions in Las Vegas. Retractable banner stands are easy to set up, are very large ( the most common size is the 33″ x 80″ upright model which is almost 18 square feet of print ) and can be easily moved and set up independently of other graphics. These retractable banner stands are a great stand alone display graphic. Cheapest retractable banner stand sign printing can get you many different sized banner stand displays at great pricing. The popular 33″ x 78″ retractable banner stand with adjustable pole for height is less than one hundred dollars and comes with print, stand and carrying case. These banner stands come in a multitude of sizes, ranging from about 2 feet wide to around 5 feet wide with prices ranging from under one hundred dollars for the small and economy models to under tow hundred dollars for the deluxe and large models. Cheapest retractable banner stand sign printing can be done the same day in cases of emergency. Every convention season in Las Vegas, many delivery companies lose or damage packages that are destined for the convention centers. Other times the graphics are simply forgotten and left back home or need replacing at the last minute because of marketing strategy updates. In any case, the graphics need to be replaced in a hurry and fortunately, Las Vegas has many sign stores that can assist in making these banner stands and other signs in a hurry. Sign stores have the latest technology in printers that can print your banner and sign quickly and professionally. Contact a local Las Vegas sign store today if you should need cheap, inexpensive banner stands. Fast Banner Stand Sign Printer in Las Vegas. March 8, 2019 Robert W.
Fast banner stand sign printer can make those quality retractable banner stand signs fast and inexpensive in Las Vegas. Las Vegas is at the top of the trade show and convention field and hosts hundreds of events per year that require thousands of signs, banners and banner stands. Las Vegas are sign stores are geared up for this challenge and have state of the art sign facilities that can print and make those banner stands the same day in many cases. Many companies come into Las Vegas for these events and present at them. These companies and businesses will either bring there graphics with them or will buy them locally in Las Vegas and then simply pick them up. Unfortunately, many times when they bring their display graphics with them the graphics will show up damaged or not show up a t all. In cases like these, the signs and banners need to be replaced in a hurry. Fast banner stand sign printer can make those banner stands often the same day they were ordered or have them the next day. Often, the same day banner stand printing in Vegas is at no additional cost if the sign shop has the ability to print it without changing production schedules. Many of the same day banner stands that are offered are under one hundred dollars in price and well below two hundred dollars for the deluxe banner sands and larger banner stands ( 57″ wide x 78″ tall ). The banners are printed on a anti curl material substrate or a 13 ounce vinyl banner in full color, which can include pictures, logos and backgrounds. Fast banner stand sign printer can be found at sign stores that service the trade shows and conventions. These sign stores are generally located within a mile of the famous Las Vegas Strip. 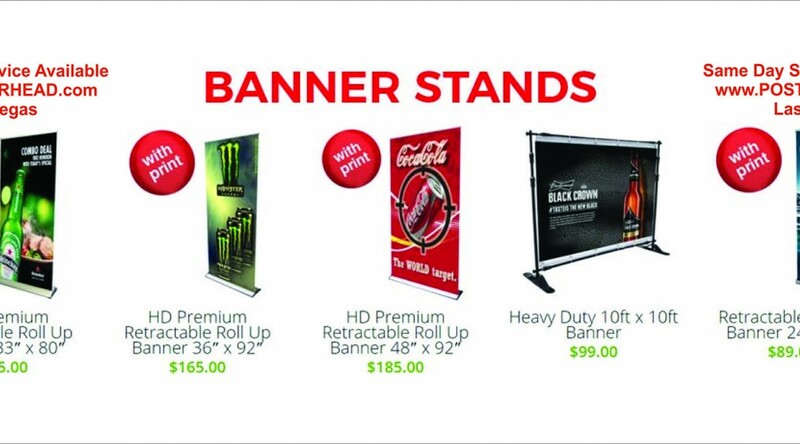 March 4, 2019 Robert W.
Wholesale banner stand sign printing can get you those retractable banner stands at discounted prices in Vegas. After all, why do you need to pay retail for retractable banners stand signs when you can get them made at a discount in Las Vegas. Wholesale banner stand sign printing can get you the popular 33 x 80 banner stands at less than one hundred dollars. This includes print, banner stand and carrying case . Wholesale banner stand sign printing can get you those banner stands in a multitude of sizes. The most popular size , the 33″x80″ costs less than one hundred dollars and even the very large 57″ x 78″ stands are less than two hundred dollars. These are long lasting banner stands with a anti curl substrate that stops the edges of the banner print from curling on the perimeter. These prints can be full color and you can also print pictures and logos on the banner as well. Wholesale banner stand sign printing can be done the same day in cases of emergencies in many situations. ( Normally they are next day ) This same day banner stand printing is often needed during the convention and trade show season in Las Vegas because often banner stands and signs get misrouted during shipping and need to be replaced at the last minute. Other times, changes in marketing strategy requires all new signage to promote the new sales plan. Modern day large format printers are more efficient than ever and offer quick printing at very high quality for retractable banner stands. These printers print very fast and are capable of more production than ever before, which is why the cost of printing banner stands have fallen over the last couple of years. Efficiency has become the rule of thumb when printing signs, banners, banners stands and other types of signage. 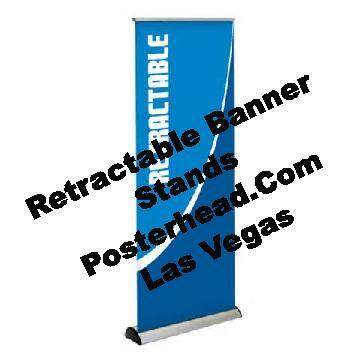 Banner stand printing shop in Vegas can get you those vertical banner stands printed and made in Vegas. Banner stands are a very popular graphic for meetings and one of the most popular graphics at trade shows and conventions. Just walking through a convention or trade show venue will allow you to see just how popular these stand alone displays are. The banner stands are self standing and can be placed anywhere without support, which makes them a crowd favorite. Banner stand printing shop can make those banner stands cheap and affordable for locals and also the businesses that come into town to display at the events. These businesses come into town by the thousands during the trade show and convention season. They bring millions of people into Vegas for these shows and boost the local economy. Las Vegas has many convention venues with over one million square feet of floor space that can be divided up so that multiple events can occur at the same venue simultaneously. Banner stand printing shop can make those banner stands very fast in cases of emergency. Often, the banner stands can be made the same day since the graphics are often already designed and just need to be printed. One of the most popular display graphic banner stands, the 33″ x 78″, can be printed and mounted for under one hundred dollars. Banner stand printing shop can make various size banner stands ranging from about two feet wide and about 7 feet tall all the way to around 5 feet tall and about six and a half feet tall. The banner stands are all full color, meaning you can have various colors on the stands along with pictures depicting scenes and products. Contact a local banner stand printing shop if you should need a fast, affordable banner stand. January 21, 2019 Robert W.
Pull up displays are great for the trade shows and conventions in Las Vegas. Pull up displays are very popular at these events because they are very easy to set up and take down. In addition, pull up displays take up very little room and can be placed virtually anywhere because they are self standing. These pull up stands are a vendor favorite for the reasons listed above. Also, they are considered a inexpensive graphic and can be used multiple times at various shows and events. Pull up displays come in many sizes ( widths and heights). The most popular pull up display is the 33″ x 78″ size that is 33″ wide and 78″ tall. ( This model is particularly popular with vendors because it costs less than one hundred dollars for the stand, graphic and carrying bag ) This graphic has over 17 feet of display space available for print and can have full colors, logos, pictures of products on it as well. Pull up displays come in many other sizes such as 24″ wide to around 60 ” wide and heights up to 92″. Often, vendors will make a banner wall them for the back of their booths by taking a large graphic and cutting it up to three or four stand widths and then placing the banner stands next to each other so that it looks like one large graphic. Best of all, al this can be done with one person rather than hiring the union workers to come in and set up your display at a very high cost. Pull up displays usually take a few days to print and assemble, but in cases of emergency ( which happens a lot at major conventions because of the confusion and missing signs ) they can be printed and made the same day. Contact a sign store today to see how pull up banners can help your display. Banner stand sign printing in Vegas can get you those banner stands needed for events and shows quickly. Often, vendors come into Las Vegas for the trade shows and conventions and find themselves without their banner stands. They are either missing or damaged and need to be replaced fast for the show. Sometimes the shipping companies entrusted with shipping the banner stands fail to show up on time ! In any case, the important thing is that those banner stands can be replaced in a hurry. Banner stand sign printing can be completed the same day in Vegas by many sign stores. January 13, 2019 Robert W.
Telescopic pull up banners are another name for adjustable banner stands that are great for retail displays and events. These crowd favorite display take up very little room and are cost effective. Telescopic pull up banners come in many sizes and are very easy to set up. Set up time is less than two minutes for these graphic displays. Telescopic pull up banners are more popular than ever in retail clothing stores where it is easier to set up a banner stand than to set up a mannequin. The banner stand takes up far less room, can be placed anywhere since the graphic goes straight up and can have different models on it to display clothing lines. This is very cost effective where space is a large consideration. Telescopic pull up banners are also very popular at conventions and trade shows where space is limited in vendor booths. These portable telescopic pull up banners can be placed in the middle of an aisle or flat up against a wall. They come in a multitude of sizes ( widths and heights) that allow you to match your graphic needs to the size. Best of all, you can take a very large graphic and divide it up and make separate banner stands and then place them next to each other so it appears to be one large graphic. Instead of large backdrop banners for vendor booths, business people are just placing three of these banner stands next to each other and it is almost 10 feet wide ! Telescopic pull up banners can be designed and printed at sign stores all over the Las Vegas area at very good pricing. Since telescopic banner stands are a favorite at the shows and events, most sign stores carry them in stock and can often print and make them the same day. January 11, 2019 Robert W.
Same day pull up banners in Vegas can be done and is done many times for the trade shows and conventions that come into town. Hundreds of events come annually to Las Vegas and in doing so, many vendors need thousands of banners, banner stands and signs to display their products at these shows. Pull up banners are a big part of a vendor display package and many times, same day pull up banners are necessary for a variety of reasons. The Consumer Electronic Show or CES is coming into town next week and so is the World of Concrete Convention after that. Many of these vendors who plan on displaying their goods and services at these large conventions will find themselves in need of same day pull up banners and same day signs because there signs and banners will go missing, show up damaged or just not show up at all. In cases like these, vendors need to know that they can get their graphics replaced quickly and inexpensively in Las Vegas through the sign stores that cater to their industry. Many sign stores are located adjacent to the Las Vegas Convention Center, Mandalay Bay Convention Center or Sands Exposition Center so that they can make those last minute signs and banners fast and get them delivered to the venues. Same day pull up banners should not sot more than usual if the sign store has the ability to make then during the normal course of business. The sign store might charge a premium if they need to pay overtime to finish other work. The good thing is that sign stores always seem to have many banner stands in stock if they should be needed, since banner stands ( in the economy and deluxe models) are one of the most favorite signs at a convention.